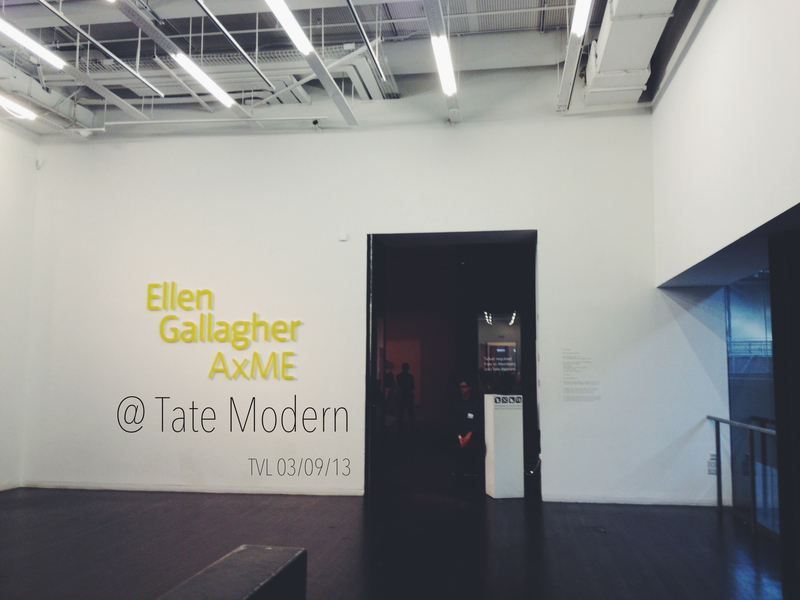 I went to view the Ellen Gallagher show at the Tate Modern on the last day. I decided to visit later in the exhibition due to a large amount of critical opinion. I wanted to hear/read everyone’s perception first. I exited with a book of notes and only have a paragraph to share as her inspiration literally took me in to another world; I am lost for words. Many writers have labelled the show as the Artist using “subtle” references to black history. Yet in my opinion, black history is the true nucleus of this exhibition. She welcomed us with a self portrait starring at Neurologist Sigmund Freud, almost suggesting to us that she was intending to change the way we think. This was the beginning of many quiet connotations. Being a mix media (Contemporary) Artist,layering and manipulation are two very important and massively symbolical techniques that she has presented exquisitely. Beneath the wit, the hue and the 3D application,lays history. Which is perfectly represented in one of her most famous pieces Bird in Hand (2006). Our societal attention is also challenged, as she delves in to the world of beauty. The visual puns shape,or question rather our judgement of true allurement and the ‘Art’ of glamorisation. One of my favourite pieces was the Untitled enamel and rubber portraits that she created in 1999. The entire piece is black rubber with ingenious enamel/paper manipulation. Though the piece seemed to have an Op Art effect, I saw adornment, culture and identity mishap. She most definitely wanted us to look deeper in to the piece, have a connection with the portraits but most of all to leave with a rooted mindset and thirst for knowledge. This is by far the best Curation (Juliet Bingham) I have seen at the Tate Modern. The journey of her work complimented the design of the building (Third floor). It was as though I was walking through the rooms which mirrored a thought-provoking book; where each chapter delved further in to history. Some may see this exhibition as a mythical adventure, something quite satrical and whimsical. However,we all know that there is truth within jest and I intend on doing my research.